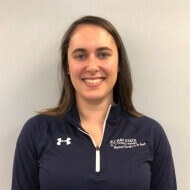 Lauren graduated from Northeastern University with her Doctorate of Physical Therapy in 2014 after receiving her B.S. in Rehabilitation Science in 2013. She has experience working with a wide variety of patient populations, including pediatrics, geriatrics, orthopedics, and neurological conditions. Lauren enjoys working with patients of all ages to help them reach their full rehabilitation potential. When not at work Lauren enjoys staying active, spending time with friends and family, going to the beach, and traveling. Lauren sees patients daily Monday-Friday in the Attleboro office.